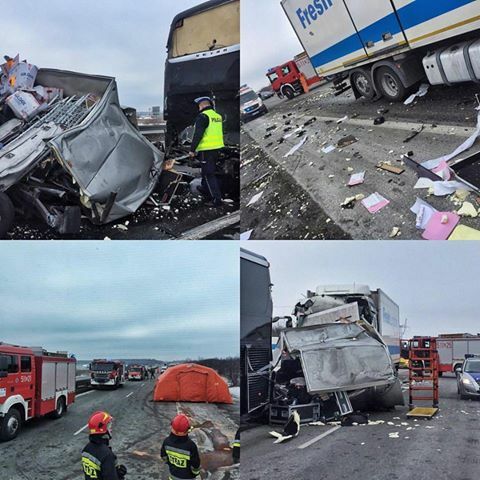 The Dillinger Escape Plan were on their way to Krakow, Poland on Februuary 12th when they were involved in a horrific accident. A truck collided with their bus leaving 13 people injured. The band was hospitalized and consequently cancelled the remainder of the european tour. Earlier today, the guys issued a statement regarding the accident, updating the fans on the band's condition and expressing their gratitude to both fans for the support and to the Polish police and paramedics. By now I'm sure many of you have already heard the news, but we wanted to communicate to you all directly. Not just to express the fact that nobody is in critical condition, but to express our gratitude to the fans who have seen us or who were going to see us on this tour, the crew who was also in the accident with us and part of why things have been going so smoothly, the various promoters and venue staff, Live Nation Poland who have been so helpful in the last 38 hours, the many police and medics and emergency workers who came to the scene, the hospital workers, and the friends and family who have reached out to us personally since yesterday morning. We were in the middle of playing some of our favorite shows we've ever played, and having a better time on and off stage than we have in a long time. We were ripped out of sleep at 8:25AM to what still feels like a lucid nightmare. The cacophony of metal bending and things breaking and people screaming and what felt like being hit by a missile. Without going into detail, not everyone is out of the hospital yet, and some of us are hurt worse than others. Questions like why did this happen, why are we alive and others not, why are the people from the Bay Area fire dead, why at all is anyone here or not. What the hell is all of this. Remember how valuable life is. We are all lucky to be alive. To just have any time at all.